Leading Innovation - The Executive Team needs to effectively sponsor the innovation initiative for it to deliver sustainable results. Our Executive Leadership workshops develop effective sponsorship, including how to create, support and sustain an innovative climate. Key topics include linking innovation to business strategy, establishing an environment of innovation, understanding innovation styles and benchmarking innovation capacity through our Innovation Readiness Assessment. 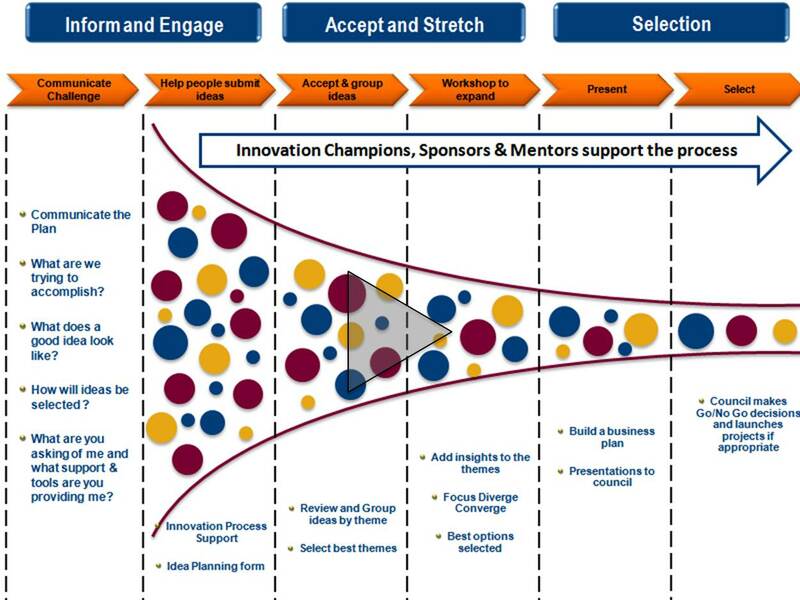 Innovation Champ Readiness - Departmental Innovation champs need to be trained on how to encourage innovation, assess the pipeline of new ideas coming from their area, and escalate for resourcing and testing. This is typically initiated as a custom workshop (aligned with the business strategy) and supported through ongoing coaching and support. Customer Ethnography Retreat - Integrate your customers directly into your product/process design process using our Open Innovation approach. When performed with strategic customers, this workshop establishes your innovation thought leadership and elevates your strategic position with your customers. The Innovation Funnel enables ideas to be evaluated for viability through a process of filters, gates and rules. At each stage in the ideation process, ideas either pass through the filters and gates, or they fail to meet the criteria to advance. Ideas may become archived (e.g., if it is not justified at the time) or may continue to pass through to additional stages. The key objective is to generate a large number of ideas relevant to the current business situation to enable new growth. At The DeSai Group, we help expand the inbound idea flow into the funnel (in alignment with your long-term business strategy). In addition, we identify innovation blind spots and constraints through our Innovation Execution Methodology. Our Strategy-Driven Innovation framework defines 3 planning perspectives (including cost containment of the current business, incremental growth with adjacent customers, and new market expansion). The Framework also identifies 10 categories in which to innovate (which spann strategy, process, offerings, and delivery). The combined result is 30 dimensions that can yield ideas for your innovation funnel. Harvesting the best of those ideas is the Innovation Management Process magic, where we define the right stage gate criteria to advance qualified ideas and resist investment in less valuable ideas. To learn more about how we can collaborate to build or optimize your own innovation management process and innovation funnel (using our proprietary tools), fill out the form below, email us at info@desai.com or call us on 860-233-0011 to set up an exploratory meeting. We invite you to learn more via our resources page where you can access articles, podcasts, blogs, and videos.